Squash is without a doubt one of my favorite foods in the fall. One walk through the grocery store and you’ll see such a fun mix of colors, textures, and sizes of squash. I use nearly every chance I can to put them into dishes, whether they are the star like my Delicata Squash with Sage Butter, or a side component like this salad. They add a creamy texture and extra fiber to a vegetable dish. This time, I’ve used acorn squash to bring out the sweet and spicy flavors of Mexican cuisine. The squash is roasted with warm flavors like cumin and cayenne pepper. The spicy taste is balanced by creamy avocado, rich queso fresco, and crunchy pumpkin seeds. Splash it with the pumpkin spice vinaigrette and you have a great salad for fall dinners. Cut the ends off the squash with a serrated knife. Cut the squash in half lengthwise and remove the seeds with a spoon. Cut the two pieces in half again lengthwise and cut into 1 inch strips. Place on a cookie sheet in one even layer. Toss the squash with the cayenne, cumin, honey, and vegetable oil. Season with salt and pepper and place in the oven for 35 minutes, or until soft. While the squash cooks, make the dressing by combining all of the ingredients in a small bowl. Whisk well to combine and set aside. When the squash has finished cooking, remove from the oven and cool for about 5 minutes. 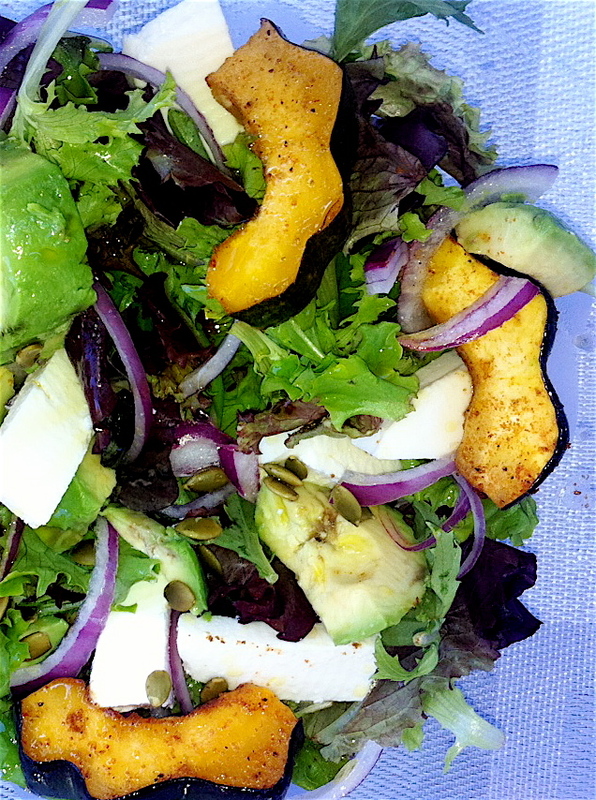 Toss the mixed greens with the avocado, queso fresco, red onion, squash, cilantro, and pumpkin seeds. Drizzle with dressing to serve.